AVO reported that a 400-m-wide "melt-water lake" formed in the snow-and-ice filled summit crater of Chiginagak sometime after the previous observation in August 2004. Earlier this summer, the southern crater rim of Chiginagak was breached, allowing a portion of the lake to drain. The resulting lahar left a deposit on a glacier draining the crater to the S and caused flooding of 1-2 m above normal at Indecision Creek. The breach in the crater rim and the ensuing lahar probably occurred in July 2005; there were reports from a nearby lodge at this time of strong sulfur smells and cloudy, yellowish water in the Indecision Creek drainage. There were no indications that an eruption is imminent or that this event is necessarily precursory to an eruption. Chiginagak is not seismically monitored, so AVO did not assign it a Concern Color Code. We previously reported fumarolic activity from November 1997 to August 1998, but issued no subsequent Bulletin reports for Chiginagak. This report covers the formation of a summit ice cauldron and crater lake and subsequent draining of the lake resulting in the acidification of Mother Goose Lake during 2000-2010. Records of Chiginagak's past activity are poor. It is not seismically monitored and, because of its remote location, much of the information is limited to observations of nearby residents. 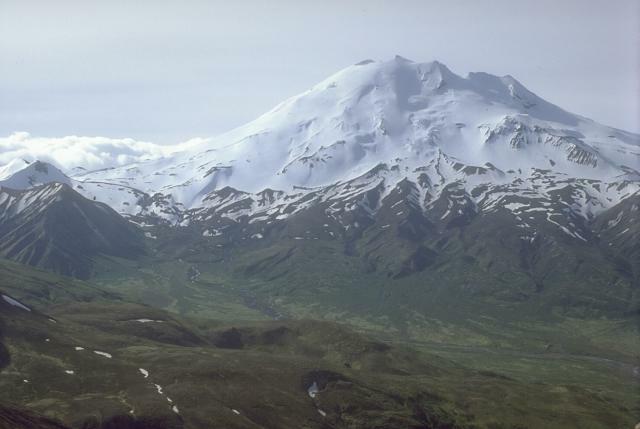 The primary source of information for this report has been Alaska Volcano Observatory (AVO) annual reports (McGimsey and others, 1999; McGimsey and others, 2004; Neal and others, 2004; and McGimsey and others, 2008). Increased fumarolic activity occurred from November 1997-August 1998. AVO reports that the activity during that time was a result of formation of new fumaroles on the N flank of the volcano. In November of 1997 an increase in steam emission led to increased snowmelt (BGVN 22:11). The steam was accompanied by the smell of sulfur. Through January 1998 a robust steam plume was observed by AVO several times. In March 1998 vigorous fumarolic activity continued, characterized by gray clouds and a strong sulfur smell that was reported up to 49 km away. In August 1998 a plume of black ash and greenish-yellow gas rose from the volcano's fumaroles. In late July-early August 2000 Chiginagak again released a larger than normal plume. Glacial Outburst Flooding. Between November 2004 and May 2005 non-explosive geothermal activity melted the snow and ice filling Chiginagak's summit crater, forming an ice cauldron ~400 m wide and ~105 m deep. The melt waters formed an acidic lake within the cauldron. The water from the lake melted a tunnel through the summit ice, draining the cauldron. The resulting lahar flowed down the SW flank of the volcano probably in May 2005, photographed August 20, 2005 (figure 1). Figure 1. Lahar deposits on the SW flank of Chiginagak, caused as a result of draining of the lake, which likely occurred in May 2005. Photograph by Game McGimsey, AVO/USGS, August 20, 2005. The water from the cauldron continued downstream into Mother Goose Lake, ~27 km downstream to the NW of Chiginagak (figure 2) and in August 2005 Mother Goose Lake became acidic, with pH dropping to 2.9. This killed the majority of aquatic life in the lake and damaged flora surrounding both the lake and the rivers (Indecision Creek and Volcano Creek which transport water from Chiginagak to Mother Goose Lake and King Salmon River that flows from the lake). Below a pH of 4.5, essentially no large fish are able to survive (figure 3). It is not just the acidity that kills aquatic fauna but also high levels of metals such as Al and Fe. At a pH of 5, Al3+ becomes insoluble and has a toxic effect on fauna. The acidic water was accompanied by sulfurous, clay-rich debris and acidic aerosols. The high acidity of the lake prevented the annual salmon run that typically ascends into Mother Goose Lake. Figure 2. Acidic water from Mt. Chiginagak escaped the summit cauldron lake and traveled downstream into Mother Goose Lake. Bold lines indicate drainages that were affected by the acidic water, and thin lines indicate unaffected drainages. Modified from Schaefer and others (2011). Figure 3. This chart shows the varying pH levels at which aquatic life either leave an environment or die. Courtesy of U.S. Environmental Protection Agency (EPA). The pH at Mother Goose Lake has been monitored since 2005 and the pH has slowly returned to normal. By 2010 the lake water returned towards normal conditions; pH reached 5.2 and a variety of fish have returned to the lake. By August 2011 the pH had reached 6.9. In 2005, Kassel (2009) studied the slurry pH deposited at Mother Goose Lake. Slurry pH is the standard method for estimating pH of soils; it is similar to pore water measurements. The details of the process used can be found in Kassel (2009, p.27-30). The slurry pH of Mother Goose Lake in 2005 was approximately the same as the pH of the lake at that time. The assumption can be made that slurry pH reflects lake pH at the time of deposition. Based on slurry pH seen in core samples, at least 7 similar events have occurred at Mother Goose Lake in the last ~3,800 years, including the 2005 event. Only one of these events was associated with tephra deposits, therefore the majority of the events were seemingly triggered by non-explosive geothermal activity, similar to the event in 2005. According to McGimsey and others (2008), "The area is remote, and the active fumaroles frequently produce visible steam plumes, which have been mistaken for eruptive activity. Unverified reports of minor activity are attributed to 1852, 1929, and 1971. An event similar to the outburst flooding in 2005 may have occurred in the early 1970s according to third-person accounts from a cabin owner on Mother Goose Lake, who reported flooding from the volcano, discoloration of the lakeshore, vegetation damage, and interruption of the annual salmon run (Jon Kent, local lodge owner, oral commun., 2004)." References. US Environmental Protection Agency, 2008, Effects of Acid Rain - Surface Waters and Aquatic Animals, Updated 1 December 2008, Accessed 15 Febuary 2012 (URL: epa.gov/acidrain/effects/surface_water.html). Kassel, CM, 2009, Lacustrine Evidence from Mother Goose Lake of Holocene Geothermal Activity at Mount Chiginagak, Alaska Peninsula, Northern Arizona University, 276 p.
McGimsey, RG, and Wallace, KL, 1999, 1997 Volcanic Activity in Alaska and Kamchatka: Summary of Events and Response of the Alaska Volcano Observatory, Open-File Report 99-448, U.S. Department of the Interior, U.S. Geological Survey, 42 p.
McGimsey, RG, Neal, CA, and Girina, O, 2004, 1998 Volcanic Activity in Alaska and Kamchatka: Summary of Events and Response of the Alaska Volcano Observatory, Open-File Report 03-423, U.S. Department of the Interior, U.S. Geological Survey. McGimsey, RG, Neal, CA, Dixon, JP and Ushakov, S, 2008, 2005 Volcanic Activity in Alaska, Kamchatka, and the Kurile Islands: Summary of Events and Response of the Alaska Volcano Observatory, Scientific Investigations Report 2007-5269, U.S. Department of the Interior, U.S. Geological Survey. Neal, CA, McGimsey, RG, and Chubarova, O, 2004, 2000 Volcanic Activity in Alaska and Kamchatka: Summary of Events and Response of the Alaska Volcano Observatory, Open-File Report 2004-1034, U.S. Department of the Interior, U.S. Geological Survey. Schaefer, JR, Scott, WE, Evans, WC, Wang, B and McGimsey, RG, 2011, Summit Crater Lake Observations, and the Location, Chemistry, and pH of Water Samples Near Mount Chiginagak Volcano, Alaska: 2004-2011, Report of Investigations 2011-6, State of Alaska Department of Natural Resources, Division of Geological & Geophysical Surveys. Information Contacts: Alaska Volcano Observatory (AVO), a cooperative program of a) U.S. Geological Survey, 4200 University Drive, Anchorage, AK 99508-4667, USA (URL: http://www.avo.alaska.edu/), b) Geophysical Institute, University of Alaska, PO Box 757320, Fairbanks, AK 99775-7320, USA, and c) Alaska Division of Geological & Geophysical Surveys, 794 University Ave., Suite 200, Fairbanks, AK 99709, USA; State of Alaska Department of Natural Resources, Division of Geological & Geophysical Surveys, 3354 College Rd., Fairbanks, Alaska 99709-3707, USA. Beginning 22 October, the Alaska Volcano Observatory (AVO) received several reports of increased steaming, snowmelt, and sulfur smells at Chiginagak volcano. Residents of the area, including the community of Pilot Point (60 km NW), noticed increased steam emissions as early as mid-summer 1997. Possible new thermal anomalies were detected on AVHRR satellite imagery in late October. According to AVO, this change in fumarolic activity may have reflected increased heat flux at the volcano. On 30 October, observers on an AVO flight reported an enlarged area of fumarolic activity directly above previously known sites, including new fumaroles at approximately 1,920 m. However, there were no signs of recently erupted ash, large-scale melting, or mud flows. Observers at Pilot Point reported vigorous steam emissions over the following weeks. During the first week of December, persistent poor weather conditions obscured observations; however, steam was observed on 2 and 3 December. No thermal anomalies were observed on satellite images during the first week of December. Chiginagak is not monitored by scientific instrumentation; however, satellite imagery and observers in Pilot Point provide information. In addition, Chiginagak is located in a National Wildlife Refuge; the U.S. Fish and Wildlife Service frequently overflies the area, especially when activity persists or intensifies. Bad weather obscured both visual and satellite observation of Chiginagak throughout most of December 1997 and January 1998. Residents of Pilot Point (60 km NW) reported a robust steam plume on 2 December and some less intense puffing on 3 December. No further activity was reported, generally because of the poor weather, until Pilot Point residents again saw a plume on 9 January 1998. AVO had received several reports of increased steaming, snow-melt, and sulfur smells at the volcano beginning in late October. Prior to that, residents of the area, including those in Pilot Point, had noticed increased steam emissions as early as mid-summer 1997. Chiginagak is not monitored by scientific instrumentation; however, satellite imagery and observers in Pilot Point provide information. In addition, the volcano is located in a National Wildlife Refuge; the U.S. Fish and Wildlife Service frequently overflies the area, especially when activity persists or intensifies. 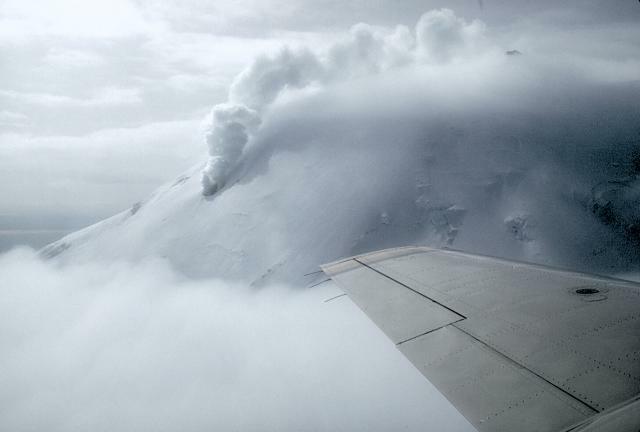 When scientists from the Alaska Volcano Observatory (AVO) conducted an overflight to Chiginagak on 11 March, the summit was visible but a thin cloud layer at about 1,700-1,900 m altitude obscured the fumarolic areas. Above the fumaroles, however, bulbous gray clouds penetrated through the thin cloud layer and extended to about 2,100 m altitude. A strong sulfur smell was noticed 16-49 km downwind of the volcano. The gray clouds and sulfur smell supported observations from Pilot Point (60 km NW) that indicated continued vigorous fumarolic activity. Increased fumarolic activity has been reported at the volcano beginning as early as mid-1997 (BGVN 22:11 and 23:01). According to AVO, the increased activity did not imply an imminent eruption. Residents of the town of Pilot Point and personnel of the U.S. Fish and Wildlife Service reported on 13 August that the usual white steaming of Chiginagak fumaroles had changed for a time. The volcano had begun to issue puffs of black ash accompanied by a greenish-yellow gas-and-steam plume that rose 150-300 m above the summit. By the following morning a dusting of black ash was observed on fresh snow on the upper part of the volcano. The plume had reverted to white steam. The activity was not substantial enough to be detected by satellite imagery. The Alaska Volcano Observatory has no seismic instruments at the site. The symmetrical, calc-alkaline Chiginagak stratovolcano located about 15 km NW of Chiginagak Bay contains a small summit crater, which is breached to the south, and one or more summit lava domes. Satellitic lava domes occur high on the NW and SE flanks of the glacier-mantled volcano. An unglaciated lava flow and an overlying pyroclastic-flow deposit extending east from the summit are the most recent products of Chiginagak. They most likely originated from a lava dome at 1687 m on the SE flank, 1 km from the summit of the volcano, which has variably been estimated to be from 2075 to 2221 m high. Brief ash eruptions were reported in July 1971 and August 1998. Fumarolic activity occurs at 1600 m elevation on the NE flank of the volcano, and two areas of hot-spring travertine deposition are located at the NW base of the volcano near Volcano Creek. Smith W R, Baker A A, 1922. The Cold Bay-Chignik district, Alaska. U S Geol Surv Bull, 755-D: 156-157 & 191-192. There is no Deformation History data available for Chiginagak. There is no Emissions History data available for Chiginagak. Chiginagak is a glacier-covered stratovolcano with a deep breach on the SW flank (right) that extends to its small summit crater. The most recent products of the volcano are an unglaciated lava flow and an overlying block-and-ash-flow deposit on the east side. Reports of historical activity are sparse. An ash eruption may have occurred in 1971. Hot springs occur near the base of the volcano on the north flank. A large steam column rises from a fumarole at about 1600 m altitude on the north flank of Chiginagak volcano on the Alaska Peninsula in May 1994. Strong steam emission is a common occurrence at this volcano and can be mistaken for eruptive activity. Photo by Chris Nye, 1994 (Alaska Division of Geological and Geophysical Surveys). There are no samples for Chiginagak in the Smithsonian's NMNH Department of Mineral Sciences Rock and Ore collection. Large Eruptions of Chiginagak Information about large Quaternary eruptions (VEI >= 4) is cataloged in the Large Magnitude Explosive Volcanic Eruptions (LaMEVE) database of the Volcano Global Risk Identification and Analysis Project (VOGRIPA).